I did not think it would be possible to cover the hugely tall weld plants, and I could also tell that plenty of seeds had matured on the weld already. I think I have written about this before, but just as a refresher I will remind readers that weld flowers keep growing off of the same stalk throughout the season. At harvest time, the tips will still be in bloom while the oldest seed heads at the base of the flower stalk will be mature. Only black weld seeds are viable. Every other color of seed, from brown to yellow, gets tossed in with the flowering tops, leaves, and stalks for the dye pot. So, that morning I clipped off the most mature-looking seed heads and put them in a brown paper bag to dry. I cut down all the plants that had bolted, tossed them in the van, and drove to the co-op. The weld basically filled up the van. Well, it filled up the part that wasn’t already full of flax. The plants stayed in the van for a couple days until Matthew declared them too stinky. I am inured to many strong smells, and weld is no exception. To me it smells like asparagus. I think it’s a nice smell, usually. One year my crop smelled like cat pee as it dried. That was intense. Matthew thinks it smells like pee after you’ve eaten asparagus. Strong, weird, and worrisome until you remember that you ate asparagus. I’m not sure if I’ve ever mentioned this, but we are a one-car (or one-van) household, so obviously the weld had to dry elsewhere. We don’t have a lot of space at our apartment, so drying options were limited. I moved the weld from the van into the “crafts room” where my loom is. It took up a good portion of the room. However, the door can shut and the windows can be opened, and the weld dried pretty well in there without contaminating the rest of the apartment with stinkiness. 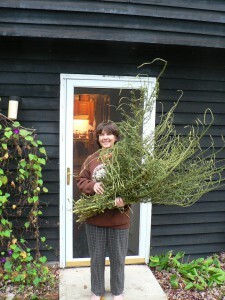 Here I am holding the harvest after it has dried and shrunk down quite a bit, two weeks after harvest. You can see the delicate yellow flowering tips at the ends of some of the stalks. I will have a lot of seed from this harvest. I used to think that you had to direct-seed weld. I’d read that it didn’t like to be transplanted because it has a long taproot. It is frustrating to plant it directly into the ground because germination is uneven and it takes a really long time. It’s not easy to keep the seed bed moist over days and weeks while the seeds germinate (or don’t), so for many years I found weld kind of tricky to grow. However, I have discovered that it transplants just fine. I grew a lot of seedlings this summer, which I transplanted at our Amethyst Brook garden plot this fall. I put them in the bed we had used for red onions. This is the kind of “crop rotation” we can manage in a small garden plot. I didn’t think weld would suffer from any of the same pests as alliums, though I’m not positive about this. Transplanting the seedlings that actually germinate is much more efficient and much less of a waste of time. With luck, I will have a giant crop next year. Yellow, anyone?